taIWWan 世界工業勞工: The Opium War, Taiwan, and the U.S. The Opium War, Taiwan, and the U.S. I went back to reading The Opium War, excellently researched by Julia Lowell, while up the river yesterday. I was up to the second war Britain started (with France and the U.S. support) against China's protecting its borders against illicit drugs; the wars of western imperialism in 1859. The Ching were so unprepared for European militarism. 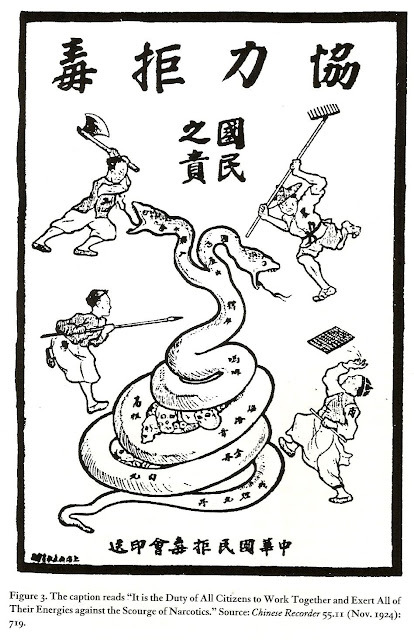 If it weren't for the Taiping Rebellion in the south and Japanese intervention in the north to fill the power void, there might not have become a May 4th Movement, nationalism, and rise of Communism to safeguard China's borders; China could have become like the Americas with the whole nation colonized, its people enslaved or massacred as natives were there. In 1860, the British sacked the Summer Palace in Beijing, looted it and burned it down. If there is anyone in the U.S. still interested in mind expansion, opening the doors of perception, turning on, tuning in, and dropping out, I am in favor of widespread cannabis usage, but to dumb down a society too weak to fight, willing to give in and let bygones be, weed IS a problem. That being said, alcohol and opiates are more dangerous to the individual and society so, pass the dutchie on the left hand side.The Taiwanese do not understand and are not told why Americans are using opiads or cannibis so much; what it is really about or what is really being done to the American people. In the corporate media in Taiwan, they did show President Trump's first lady's choice of jacket on a trip to visit children held at a detention center in Texas which said, "I really don't care. Do U?" scrawled on the back. There are many TV "all news" channels here in Taiwan, none of which show international news for long. When they do, it is a voice-over from CNN. There is "good news" about China from stations with Chinese-leaning ownership, and one independence-supporting station, founded like Pacifica from members donations, that the cable network tries to dislodge from programming using economics as a reason. There is some Asia regional news in English on cable from their corporate media, but not much. There is little awareness in Taiwan of ICE separating undocumented immigrant families from their children but none on the dismantling of the social network or workers' protection; Taiwan government is anti-union; the U.S. never imported the notion when it exported "democracy" and "duel-party" politics to stop the communist dominoes. Designer brands are paraded as news and the owner of Foxxcon, a sweatshop boss supreme, is Taiwan's Bloomberg. The English Taipei Times newspaper and Facebook and website English news page sources are dominated by the American government line. There is a large new Marine-guarded American Institute just christened which represents the U.S. govt. interests in lieu of an embassy; technically there is no recognition of Taiwan as a country. It was just celebrated by President Tsai Ying-Wen when a new representative was appointed by the U.S. There is just a whisper of the amount of protest against the further erosion of American's standard of living, liberties, and rights, with most Taiwanese thinking, like many privileged people of color, that they are honorary "whites" better than poor minorities. As you may know from reading my blog, I could not get anything going forming a solidarity union with expats or natives for an IWW GMB here mainly because of spooks on Facebook that spread fear and lies about the right to unionize here. My posts were harassed and effectually banned by a few News in English Facebook groups. Indeed, there is corruption and mafia groups that will attack any grass root unionizing but support continued special treatment and bonuses for the children of Mainland Chinese that came with Chiang Kai-Shek. In a word, in Taiwan, Trump is seen as a dangerous clown by most, especially China supporters, and as royalty by the American leaning business community; I guess being a liar and ignorant is as much a privilege of the rich as sexual harassment of women is; there is plenty of that here. However, most people understand how the U.S. has divided people; they applauded the reapproachment of North and South Korea for regional stability, some out of jealousy that this reunification could happen between Taiwan and China, too. They sense how detrimental the U.S. is to its own people and to world peace. I can remember feeling bad stuff was happening during the Clinton presidency when I returned to the States in 1989 after living in Taiwan six years. With George Bush and Iraq, Pt. I, I knew a former CIA director was the commander in chief. Like others, I voted Democratic because I thought the Democratic Party was slower to boil the frogs; the labor movement had some time to organize before the hole in the wall was closed. I went to demonstrations in NYC against the WTO and joined the IWW following the Black Bloc around. I knew time was getting thin and we had to fight back hard, but then they blew up the WTC to stifle the anti-WTO and oil organization from getting any stronger. It worked. They had an excuse to institute a police state "for our homeland protection." Bush II stole 3 trillion dollars to repay the banks in 2008 and "save our way of life" add another 3 billion Obama stole for the same reason. The military budget grew and the social programs stuttered. Obamacare was a sham. All that you said about the Supreme Court and the hanging chads; the fix was in, hard. The fascists running the USA since Washington weren't going to let the hungry tired poor immigrants get any further. Taiwanese college students don't know how terrible the U.S. government is to its own people and plenty of Taiwanese still dream of immigrating unaware that they will be unemployed and victims of prejudice, too. I choose too remain in Taiwan the rest of my life because I know there is more libery here, universal health care, and safety. While there is still time in my life, and before the end of the U.S. as we know it, I pray my children make it out alive as I did. I feel that way; that I made it out alive from America in a similar way that Jews and progressives made it out alive from Nazi Germany and Fascist Italy and Spain. I'm not suggesting that you get out, too, because that may be your karma and who am I to say, but it was a golden path for me to be where I am today. I feel safer with China nearby to protect Taiwan from any more encroachment from U.S. hegemony; to remove the last piece of colonialism of their territory, not to mention, a blow to fascism and a return to socialism. Call me a dreamer but that's how I feel. I don't need a joint to get high, and there is no reality to run away from. Copyright © 2018 by David Barry Temple. All rights reserved.